Sanctuary on Camelback Mountain is kicking off its 13th annual Lunch & Learn series, where you can learn how to whip up your own culinary masterpieces under the guidance of professional chefs. 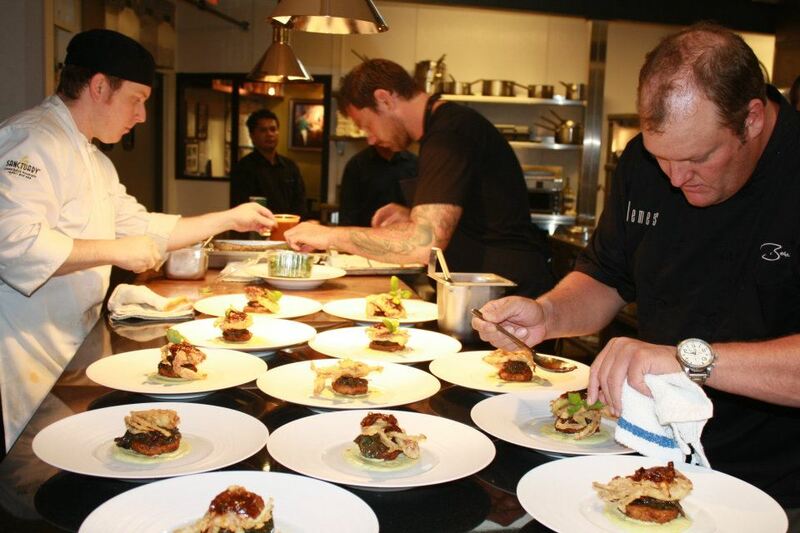 Led by Sanctuary’s executive chef and Food Network star Beau MacMillan, a special culinary expert will be invited to Sanctuary each Saturday starting July 26 through August. Lunch & Learn includes a three-course meal with wine in The Views ballroom, an interactive demonstration and take-home recipes from the pros. All lunch events start at 12 p.m. and are $75 plus tax and gratuity. The Aug. 23 dinner event starts at 6 p.m. and is $125 plus tax and gratuity. Reservations are required and can be made by calling (480) 607-2300. While you’re there, stay the night with Sanctuary’s special $199 rate for Lunch & Learn guests, which also includes a complimentary suite upgrade that’s $100 in value. July 26: Food Critic Troy Johnson is a former rock journalist turned award-winning food writer, Food Network personality and humorist, who has appeared as a judge on Iron Chef America, The Best Thing I Ever Ate and is now a recurring judge alongside Beau MacMillan on Guy’s Grocery Games. Aug. 9: Jamie Gwen is a celebrity chef, certified sommelier, cookbook author and radio personality who recently won Food Network’s Cutthroat Kitchen and served as a judge for Fox TV’s Master Chefalongside Gordon Ramsey, Graham Elliot and Joe Bastianich. Aug. 16: Chef Edward Sylvia is founder and executive chef of Manhattan’s prestigious catering company, Certé, of the go-to for Manhattan’s most prominent corporations and fashion houses, and has made frequent appearances on local and national TV. Aug. 23 (dinner event): Pastry Chef Elizabeth Falkner is an award-winning chef who has competed in multiple culinary competitions including Food Network’s Next Iron Chef, Redemption, Iron Chef America and Next Iron Chef, Super Chefs, for which she was a finalist and runner-up. She has been a three-time competitor on Food Network’s Challenge, as well as a contestant on Bravo’s Top Chef Masters.